Calliphora vomitoria: a type of meat-eating blowfly that Calvignac-Spencer used in the 2013 study. Photo courtesy of JJ Harrison. A recent study lends truth to the saying that “you are what you eat.” Dr. Sebastien Calvignac-Spencer, an evolutionary biologist at the Robert Koch Institute, has found that the gut material of flies may be the key to understanding the biodiversity of rainforests. By analyzing the DNA in the digestive tracts of carrion flies, he has developed a new method of monitoring and assessing mammalian biodiversity. About one year ago, Calvignac-Spencer began studying sick chimpanzees that were dying from a strain of rainforest anthrax in the Tai National Park of Côte d’Ivoire. Since fly gut bacteria are known to cause other strains of rainforest anthrax, he hypothesized that a similar culprit was responsible for carrying and spreading this new strain. While investigating the contents of the suspect fly guts, Calvignac-Spencer noticed that 40 percent of the flies yielded mammalian DNA. This key observation is what led to Calvignac-Spencer’s latest study. As scavengers, carrion flies eat dead animals that have fallen to the rainforest floor. While the organisms soon decompose, fragments of their DNA accumulate in the guts of the flies. 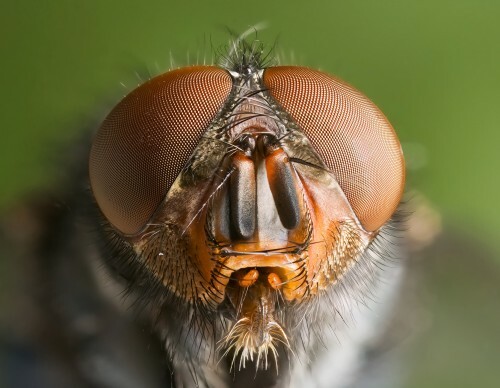 Unlike humans, flies do not possess highly acidic stomachs that they churn their food in. Therefore, the DNA will often remain unbroken for long periods of time. This DNA can easily be recovered from the captured flies and matched with the species that it came from. “[The DNA is] not gorgeous, but still usable,” he explained to Nature. 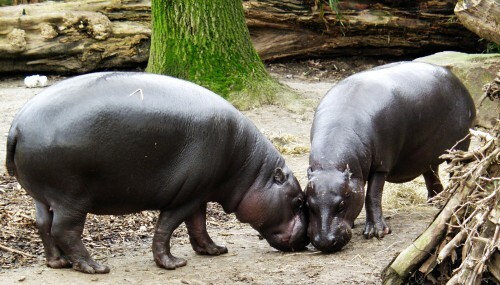 Examination of the gut material in flies from the Tai National Park of Côte d’Ivoire revealed traces of DNA from the pygmy hippopotamus (Hexaprotodon liberiensis). Photo courtesy of Raimond Spekking. Calvignac-Spencer collected 201 carrion flies from his field sites in Tai National Park, Côte d’Ivoire, and Kirindy Forest, Madagascar. His team then extracted the DNA from the tropical flies, picking out the portions containing sequences that most mammals are known to have. Finally, by comparing the selected DNA sequences to libraries of animal DNA sequences, Calvignac-Spencer was able to identify the various species that the flies feasted on. The list of species was surprisingly diverse. The flies from the Tai National Park carried DNA from 16 mammal species, including local primates, bats, a porcupine, a hippo, a shrew, and an extremely endangered antelope. The search in Madagascar was also successful, yielding four of the 31 total mammalian species on the island. Although the group only gathered 201 flies in total, increased sampling could produce a higher recovery of mammalian DNA, increasing the percentage of mammal diversity that these DNA censuses can account for. 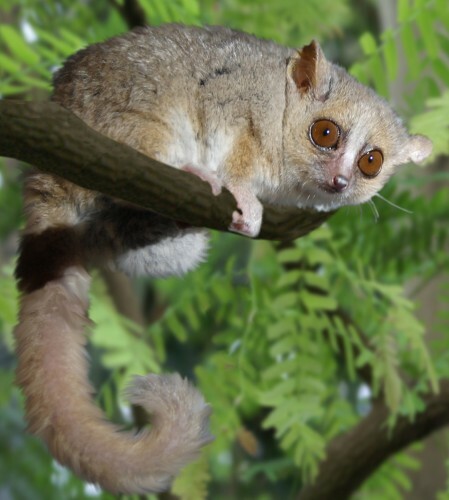 Examination of the gut material in flies from the Kirindy Forest of Madagascar revealed traces of DNA from the grey mouse lemur (Microcebus murinus). Photo courtesy of Gabriella Skollar. To monitor animal populations, researchers usually have to spend several years out in the field, counting specimens by direct observation. It is time-, resource-, and labor-intensive. Furthermore, results of traditional censuses can often become out of date very quickly, especially taking into account the amount of time that is required to collect and assess the data. Calvignac-Spencer’s new method makes the process much more efficient. Carrion flies are everywhere, and getting enough DNA samples is far quicker than trekking through the rainforest in search of an elusive species. In addition to assessing a region’s overall biodiversity, Calvignac-Spencer believes that analyzing fly guts can also be used to gather detailed information on a single species. For instance, by collecting a large enough sample of flies from a wide enough range, this method could potentially help researchers determine the species’ distribution in the area. Likewise, sampling over a period of several years could provide information about the population’s change over time, detecting population crashes or booms that would otherwise be undetected by conventional monitoring methods. 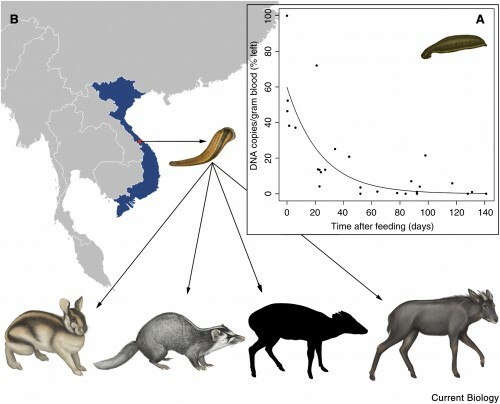 Gilbert’s 2012 study of leeches in Vietnam revealed traces of DNA from 6 mammals, 4 of which are pictured here. From left to right: Annamite striped rabbit, small-toothed ferret-badger, Truong Son munjtac (coat coloration and markings remain unknown), serow. The inset shows the decay of DNA within a leech over time. Image courtesy of Current Biology. In a discussion with National Geographic, Calvignac-Spencer cited a case in 2002 when thousands of gorillas were killed by the Ebola virus in the Republic of Congo. Standard monitoring only discovered 44 carcasses. “Flies could really be precious in this context,” said Calvignac-Spencer. Calvignac-Spencer and Gilbert’s studies are part of the growing research movement in environmental DNA (eDNA), the genetic litter that animals spread throughout their surroundings. Since the early 2000s, scientists in this new field have studied scraps of DNA that accumulate in soil, water, air, and more recently, fly guts. While these methods are still being fine-tuned, they may bring us closer to fully understanding the scope of Earth’s biodiversity.